A few Thursdays ago we went to Tracy Worcester’s dinner at Petersham nurseries in Richmond (one of our favourite restaurants in London) to celebrate the launch of her ‘Farms Not Factories’ series of films, covering chefs who use only high welfare pork, and the passionate farmers who supply them. Tracy is an absolute hero, working to raise awareness of the horrors of industrial – or ‘factory’ - pig farming, and bringing the fight to this awful industry. This is a campaign we care about very much, and we’re keen to do our bit, including being shot in one of Tracy’s 2 minute videos, along with other chefs including Mark Hix, James Golding and Hugh Fearnley-Whittingstall, cooking a pork recipe of ours, alongside one of our suppliers - Ben Goldsmith, Jemima’s husband. We were filmed with Ben showing us his pig woods in Somerset, where his Tamworth pigs are happily rooting in the cool earth and enjoying the warmth of the sun on their backs. The awful reality though is that significantly more than half of the billions of pigs in the world never experience soil, fresh air, sunshine, or the company of other pigs. Instead they are crammed into barren concrete pens, unable to move forwards or backwards or even turn around. Factory farms deprive these pigs of every possible reason for living, as small piglets, without anaesthetic, they are brutally castrated, their tails cut off, their teeth pulled out. The cruelty of this industry is unprecedented and unimaginable. And that’s not all. Factory farms pollute the ground, air and water for miles around. Their brutal efficiency and cut-throat prices drive fairer, kinder, smaller producers out of business, killing rural economies. And – most frightening of all – factory farming relies on the continuous dosing of pigs with antibiotics, to keep at bay the bacterial diseases that would otherwise run rife in such conditions. Quite simply, this appalling industry is putting people at risk. The fight to end it is one of the most important in the world today. Arriving at Petersham Nurseries takes your breath away, a place that feels fitting for a Jane Austen production. With incredible gardens of wildflowers, handsome Tuscan stone pieces and the most charming greenhouse to house the restaurant. What could be better than heading off to one of the most fabulous restaurants in London whilst simultaneously contributing to a cause that matters so much to us. We were presented with delicious seasonal Bellini’s- followed by a three-course banquet style sharing menu, organic pork from Harry Boglione’s (son of founders) pig farm. This was all deliciously put together by Damian Clisby, head chef of Petersham, James Golding from the Pig Hotel chain and Hugh Fearnley-Whittingstall. Farms Not Factories works to inspire consumers to follow the top chefs’ example by refusing factory farmed pork and only buy pork from healthy and humane pig farms. 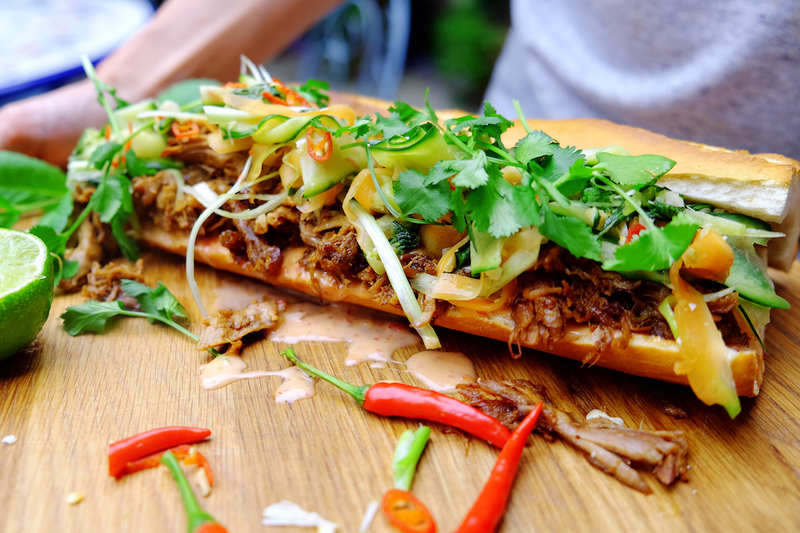 So with that, we hope you enjoy a favourite pulled pork sandwich of ours- an Asian inspired one, with lots of delicious spice, sweetness and crunch. Pork sourced from our local butchers. Certified organic! 1. Preheat your oven to 170*. In a bowl mix your marinade ingredients together. Place the pork into the marinade bowl and leave for as long as pos- we only had two hours which worked well. 2. Line a baking try with tin foil, so there is more then enough coming over the edges to wrap the pork up, place the pork in the centre and pour all the marinade over. Enclose the pork, making sure to not let the liquid out. Place in the oven for 3 hours, every 40 mins or so take out, open up, and spoon the liquid over (then close again) 3. After 3 hours open the tin foil, turning in the liquid. Place back in the oven for a further 30 minutes. Take out, let it rest. 4. Slice your cucumber into two pieces, so its half the size lengthways. Take a peeler and slice both pieces lengthways into thin strips. Do the same with your carrot, but then take a knife and slice into thin matchsticks. Put into a bowl with the other pickling ingredients, and mix well. Place to one side. After 30 mins drain most of the liquid 5. Mix your sweet chilli mayo ingredients together, set aside. 6. In the oven place your baguetes to crisp up a little (for no more then 5 mins) 7. Fork your pork up/pulling it apart. Mix it around all the remaining sticky juices. Squeeze a lime over and season. 8. Slice open the baguettes, generously spoon your mayo first, then the pork, then the pickled veg. top with torn mint and coriander (extra chilli if you like… we do! ).